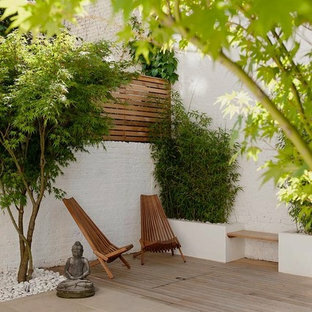 Courtyard Garden: Central London: Materials: Cedar wood slatted trellis to the dress the walling, cedar wood smooth decking to the rear with built-in seating framed by bamboo planters. Childrens play sand pit built into the decking showing the cedar top closed to create an adult space. 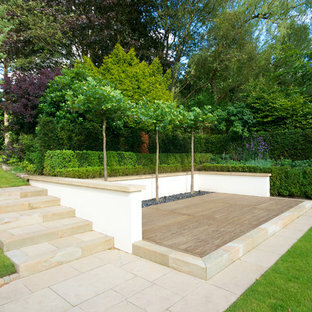 Portland limestone, sawn, all units at the same size adjacent to 2 specimen Acer palmatum. The stems have been pruned to show the sculptural essence of the branch form. Up lighter concealed within a pebble dressing. A comprehensive renovation and extension of a Grade 2 Listed Building within the Cross Street Conservation Area in Islington, London. The extension of this listed property involved sensitive negotiations with the planning authorities to secure a successful outcome. Once secured, this project involved extensive remodelling throughout and the construction of a part two storey extension to the rear to create dramatic living accommodation that spills out into the garden behind. The renovation and terracing of the garden adds to the spatial qualities of the internal and external living space. A master suite in the converted loft completed the works, releasing views across the surrounding London rooftops. 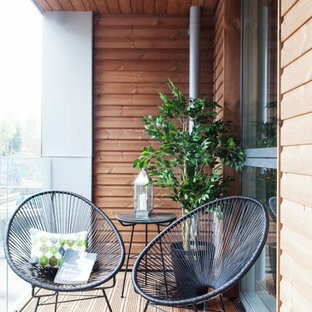 This is an example of a medium sized contemporary back terrace and balcony in London with a potted garden. 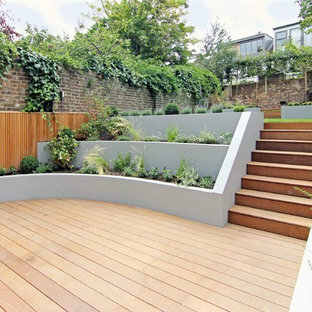 Inspiration for a contemporary garden in Manchester with decking. 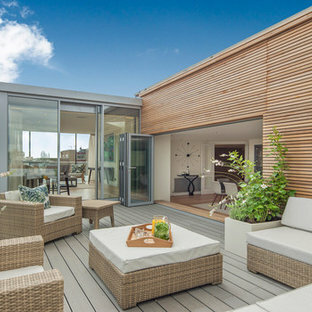 Contemporary roof terrace and balcony in London with no cover. 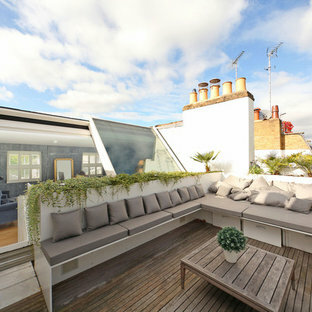 Medium sized contemporary roof terrace and balcony in London with a potted garden and no cover. Contemporary balcony in London with a roof extension. 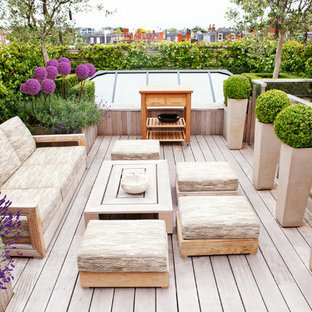 Design ideas for a contemporary roof terrace and balcony in London with no cover and a potted garden. 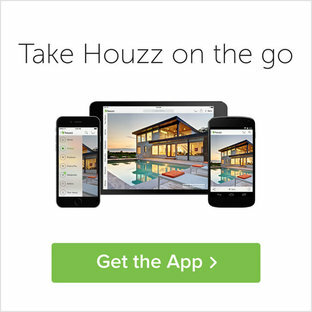 Design ideas for a contemporary terrace and balcony in London with a pergola. Contemporary courtyard patio in London with decking and no cover. This is an example of a contemporary open plan living room in Other with white walls, light hardwood flooring, a wood burning stove and brown floors. Inspiration for a medium sized contemporary roof terrace and balcony in London with no cover and a potted garden. Inspiration for a contemporary bedroom in Cornwall with white walls. We designed this bespoke kitchen be in harmony with the outdoor space with spray-painted Little Greene French Grey Mid and immaculately veneered book-matched American black walnut cabinets. 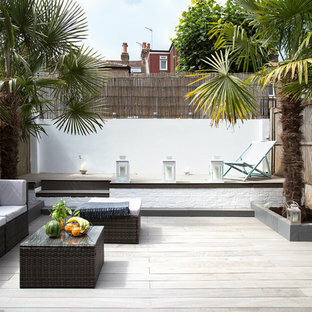 This is an example of a contemporary back patio in London with decking and no cover. Contemporary garden in Surrey with a water feature.